At the core of Democrance’s offering lie the mutually beneficial partnerships we create between insurance and telecommunications companies – two highly regulated and complex industries. We understand and anticipate the challenges that may arise during complex projects. Years of experience in the MENA region’s insurance and telecommunications industries and building technological platforms have equipped our team with the right skills and knowledge to create and drive these initiatives hand in hand with our partners. Driven by the desire to restore insurance to its original purpose of providing mutual aid for those who need it most, but can afford it least, he founded Democrance in 2015. Prior to that, Michele worked in strategy and distribution at global insurance powerhouses AXA and MetLife in France, Egypt and the UAE. Italian by birth, Michele holds a Master in Management / Grande Ecole from ESCP Europe in Paris and MSc in Economics from Turin University. He is also a graduate of Carlos III University in Madrid and City University in London. Michele is a frequent speaker and contributor to microinsurance, entrepreneurship and social innovation events and publications in the Middle East and worldwide. David joined the Democrance team as a Senior Software Engineer in 2018, bringing extensive experience in numerical catastrophe modelling, web development, risk management and product design. He began his career as an environmental engineering design consultant and has since worked with governmental bodies, engineering consultancies and multinational firms. With a strong belief in technology’s ability to enable impactful solutions, he founded Hydrata in 2015, which is a start-up focused on building collaborative web platforms that help to solve the world’s biggest water challenges. Through Hydrata, David has worked on projects that manage water and flood risks in India, Nicaragua, Haiti, the U.S. and Australia. Muhammad Ashad Chaudhary is one of the key developers at Democrance. In this capacity, he works closely with the engineering team to support Democrance’s product development and customer integration, drawing on his experience in Application development (Mobile/Web/J2EE). Before joining Democrance, Ashad held software engineering positions with Systems Limited in Karachi and Dubai, as well as Etisalat UAE. Ashad holds a Bachelor in Computer Science with a major in Software Engineering from the National University of Computer and Emerging Sciences in Pakistan. Santiago is Democrance’s in-house legal counsel. With core experience in corporate law, he has worked with a wide variety of clients across a broad spectrum of industries of all sizes in the private, public and third sectors. Before moving to Dubai, Santiago lived and practiced in a number of different countries including Spain, Norway, and The Netherlands. He holds a Licentiate in Law (LLB + LLM equivalent) from the Universidad Carlos III of Madrid and a Master`s Certificate in Project Management from George Washington University. Abdel Hafiz Fouad acts as a regional consultant for Democrance out of Sudan. Well versed in both, the insurance and telecom sectors, Abdel previously represented Celltek Egypt in Sudan before acting as a marketing consultant for his family’s insurance company, The Blue Nile Insurance (BNI), and brokerage firm, Protect Insurance Services. He later joined Elnilein Insurance and currently works with The Sudanese Insurance & Reinsurance (SUDINRECO). Abdel holds a BSc in Environmental Studies from Omdurman Ahlia University in Sudan and a Project Management Diploma from The Regional IT Institute (RITI) in Egypt. Enrique Urbaneja is an independent Global Go-To-Market Executive and Democrance’s representative in APAC. Before working in an independent capacity, Enrique held numerous senior positions with telecommunications and technology companies around the world, including Atos and Baquia among others. With more than 20 years’ experience in the mobile industry, from business development to international expansion, Enrique has an entrepreneurial mindset and founded and supported several startups, most notably Mobiadvanced, which expanded into more than15 international markets under his guidance. Passionate about social causes, and a firm believer in harnessing the power of mobile technology for good, Enrique has supported public sector in several countries to assess and design mobile early warning systems as part of disaster preparedness. Based in the APAC region out of Vietnam, Enrique supports Democrance in extending its footprint across the region. Having recently relocated to Dubai, Caroline is in charge of managing of a joint project between the Luxembourg based NGO ADA, specialising in inclusive finance, and Democrance. Funded by the United Nations, the project aims to reduce the vulnerability of low income migrants working in the UAE by providing insurance protection through an innovative remittance solution. Having previously worked as a project officer at ADA in Luxembourg, where she was responsible for the coordination of the training activities the NGO provides to the microfinance institutions, she joined the Democrance team in Dubai to be closer to the project’s target populations as well as Democrance’ expertise and know how. She holds a Master’s Degree in International Marketing and Management from the Institut du Management Européen des Affaires (IMEA) in France. Samih joined Democrance as a Board Member in 2017, bringing years of entrepreneurship and investment expertise to the table. Samih is the current Chairman of Jabbar Internet Group, a leading venture capital firm specializing in Internet and technology companies. He also serves on the boards of several companies, and was appointed a member of the Board of Trustees of the Foundation of H.R.H. Hussein bin Abdullah, Crown Prince of Jordan and is Chairman of the board for UnderMyOliveTree, a non-profit organization focused on education for the underprivileged. In 2000, Samih founded Maktoob.com, the world’s first Arabic email service provider and largest Arab online community, which was later acquired by Yahoo in 2009. He also co-founded Souq.com, the largest ecommerce site in the Arab world which was bought over by Amazon. He is a founding investor in Oasis500, Jordan’s leading start-up incubator. He has received the Social Media Influencers Summit Award in the Private Sector category, was listed in Arabian Business’s top 500 most influential Arabs globally, and has been granted the Takreem award for Outstanding Corporate Leadership in the Arab World, among other accolades recognizing his achievements. This is a section where we put up news clippings and press releases. Dubai-UAE: 4th March, 2019 – Insurance Technology start-up Democrance joined forces with leading insurer Cambodia Life Insurance (Camlife) to offer affordable and accessible life microinsurance products via the mobile channel. Through the integration of Democrance’s proprietary cloud-based platform, Camlife’s entire insurance system is digitized and automated, from marketing to claims processing. This digital transformation results in substantial cost savings and enables the Cambodian insurer to reach new market segments through mobile phones. The partnership with Cambodian mobile operator, Cellcard, means that their mobile subscribers only need their phones to buy, use and make claims for affordable life and health microinsurance product, thanks to Democrance platform. The premiums payment can be made through phone balance, and claims are paid in under four days. Life insurance is relatively new in Cambodia, having been introduced to the market only in 2012, but it is growing rapidly fueled by innovation and digital transformation such as pioneered by Democrance. Cambodia’s total gross premiums were up 57 percent year-on-year in 2017, and up 95 percent in 2016 from the previous year according to figures from Insurance Association of Cambodia. “We have witnessed rising demand for financial and risk management solutions in Cambodia, but unfortunately it has not been as inclusive and accessible to everyone. This is why together with Democrance and Cellcard, we have created a unique microinsurance offering that covers families from all economic backgrounds, and is delivered through the mobile platform,” said Seang Kimvisal, Head of ICT of Camlife. Cellcard provides the channel with which Camlife can underwrite the products and access a wider customer base of all income groups. Democrance’s role is that of an intermediary who manages the entire value chain between insurer and mobile operator. Democrance aims to change the way insurance companies view underserved markets and financial inclusion, and open up an estimated $4 billion of new insurance premiums. The Dubai-based start-up is currently working with some of the largest life, non-life and health insurers in the region, helping them digitize the front-end and back-end operations for products such as life, accident, travel, health and savings insurance. The technology platform is currently being used by leading insurers in the United Arab Emirates, Kuwait, Bahrain, Oman, Egypt, Jordan, Lebanon and Vietnam. Democrance, founded in 2015, is an insurance technology start-up with a mission to enable partnerships that make insurance accessible and affordable for those who need it most. Democrance has created a digital platform that brings together key industries – insurance, remittance houses and telecommunications companies. An insurance start-up in the UAE is working to disrupt the sector by digitising the insurance value chain to reach underserved customer segments such as low-income brackets. Through digitisation, Dubai-based Democrance’s platform allows insurers to lower operational and distribution costs to offer more affordable insurance products to low-income people, even those without a bank account. “In the Middle East and North Africa, less than 20% of the population has a bank account and only 1% can access and afford micro-insurance,” Michele Grosso, co-founder and CEO of Democrance, told Gulf News. Dubai: When used right, fintech solutions could offer the easiest way to offer products and services to low-income groups. More so when it comes to delivering insurance-specific solutions. In the UAE, there are many “insurtech” start-ups that aggregate insurance premium quotes for customers. One company — Democrance — aims to create some disruption by digitising the entire insurance value chain and unlock new customer segments. The platform allows insurance companies to reduce the distribution and operational costs and offer affordable pricing to low-income individuals who do not have a life insurance, personal accident cover or even a bank account. IN LOW-IN­COME POP­U­LA­TIONS, ba­sic in­sur­ance can of­ten mean the dif­fer­ence be­tween end­ing up on the streets or hav­ing a safety net when an un­ex­pected cri­sis strikes. Many in de­vel­oped coun­tries do not need to give health, life or ac­ci­dent in­sur­ance a sec­ond thought, but fig­ures from the In­ter­na­tional Labour Or­gan­i­sa­tion show that 55 per cent of the global pop­u­la­tion are not cov­ered un­der a so­cial pro­tec­tion sys­tem. Why is this a prob­lem? Be­cause fi­nan­cial in­clu­sion – ac­cess to fi­nan­cial prod­ucts and ser­vices such as in­sur­ance re­gard­less of in­come level – is fun­da­men­tal for vul­ner­a­ble groups to com­bat poverty and in­equal­ity at ev­ery stage of their lives. Ac­cess to life in­sur­ance can make all the dif­fer­ence for a bread­win­ner who is ex­posed to oc­cu­pa­tional haz­ards and sup­port­ing his or her fam­ily back home. Sim­i­larly, un­ex­pected hos­pi­tal bills can eas­ily drive in­di­vid­u­als to per­sonal bank­ruptcy, and those who lose their pos­ses­sions in fires and floods are of­ten not able to eas­ily re­build their lives without some form of pro­tec­tion. Un­sur­pris­ingly, the in­sur­ance pro­tec­tion gap is widest in emerg­ing mar­kets, where only 3 per cent can ac­cess or af­ford in­sur­ance. In the GCC re­gion, one out of two res­i­dents is a mi­grant worker, and con­se­quently mi­grant in­sur­ance is an in­creas­ingly im­por­tant is­sue. So what is pre­vent­ing mi­grant work­ers from tap­ping into in­sur­ance? The chal­lenges are man­i­fold, but a ma­jor hin­drance to reach­ing the unin­sured is the high costs as­so­ci­ated with con­ven­tional in­sur­ance mod­els, due to out­dated ad­min­is­tra­tion pro­cesses and ex­pen­sive hu­man dis­tri­bu­tion chan­nels. For ex­am­ple, the peo­ple in geo­graph­i­cally-re­mote ar­eas are of­ten un­der­served due to a lack of phys­i­cal ac­cess to in­sur­ance bro­kers. Other bar­ri­ers in­clude the lack of rel­e­vant prod­ucts, low aware­ness lev­els by, and in­ad­e­quate ac­cess to, low-in­come groups. UAE, to un­der­stand the needs and wants of low-in­come mi­grant work­ers in the UAE. We found that 43 per cent of re­spon­dents re­gard life in­sur­ance as vi­tal, and yet eight in 10 are unin­sured due to the high pre­mi­ums and lack of in­for­ma­tion. More than a third of re­spon­dents worry about job loss and be­ing un­able to sup­port their fam­i­lies back in their home coun­tries. These are con­cerns and risks that can be ad­dressed by the pro­tec­tion that in­sur­ance of­fers. In­creas­ingly, and be­cause of gov­ern­ment ini­tia­tives such as the in­tro­duc­tion of manda­tory health in­sur­ance, the in­dus­try is look­ing for ways to fur­ther fi­nan­cial in­clu­sion and the democrati­sa­tion of in­sur­ance. In par­tic­u­lar, the ad­vent of new In­sur­ance Tech­nol­ogy (In­surTech) can sig­nif­i­cantly re­duce the costs of sell­ing and ser­vic­ing in­sur­ance poli­cies, boost ef­fi­cien­cies and ac­cu­racy, and help un­lock new cus­tomer seg­ments that were pre­vi­ously not eco­nom­i­cally-vi­able. New so­lu­tions are on the rise, rang­ing from the wide­spread use of data an­a­lyt­ics to in­form in­sur­ers of cus­tomers’ needs and be­hav­ior pat­terns, to the in­tro­duc­tion of smart sen­sors to help mon­i­tor and col­lect real-time data to gen­er­ate more ac­cu­rate pric­ing and tackle in­sur­ance fraud. For low­in­come pop­u­la­tions specif­i­cally, in­no­va­tion can be as straight­for­ward as util­is­ing mo­bile tech­nol­ogy to al­low cus­tomers to eas­ily buy, use and make claims on their mo­bile phones, giv­ing even un­banked in­di­vid­u­als the op­por­tu­nity to ben­e­fit from in­sur­ance. In short, tech­no­log­i­cal ad­vance­ments have the power to drive down costs and fur­ther reach. While there has been a lot of dis­cus­sions about what in­no­va­tion can do to boost pro­duc­tiv­ity and the bot­tom line, I strongly be­lieve that tech­nol­ogy is without pur­pose un­less it serves hu­man­ity. Many of the is­sues that we face to­day, en­shrined in global com­mit­ments such as the Sus­tain­able De­vel­op­ment Goals 2030, are in­cred­i­bly com­plex and will re­quire multi-stake­holder co­op­er­a­tion. To re­ally make in­sur­ance af­ford­able for all, tech­nol­ogy providers and in­sur­ers need to join hands with dis­tri­bu­tion chan­nels ac­ces­si­ble to low-in­come pop­u­la­tions. While I am not sug­gest­ing that tech­nol­ogy alone holds the key to solv­ing all of the world’s press­ing is­sues, I am con­fi­dent that it is in our power to en­sure ba­sic so­cial pro­tec­tion sys­tems are in place for those who need pro­tec­tion most but can af­ford it least. • Democrance to support AIG in tapping into new customer segments through digital channels. 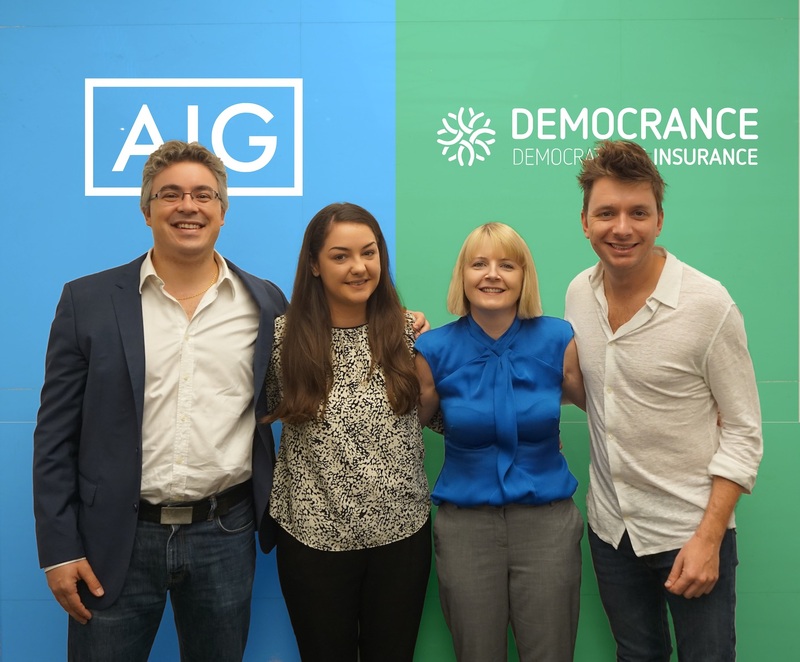 Dubai, UAE: 06 January, 2019 – Insurance Technology (InsurTech) startup Democrance entered into a unique partnership with AIG MEA (American International Group in MEA) to better serve its existing customer base, access new market segments and boost the efficiencies of AIG’s current distribution, administration and operation processes. Under this partnership, Democrance is mandated to support AIG MEA in digitizing its operations in the UAE, Kuwait, Egypt, Lebanon, Bahrain, Jordan and Oman by integrating the Democrance platform with mobile and digital channels to serve existing and new customer segments. Democrance provides front-end solutions – digital and mobile distribution of Personal Lines insurance products – as well as back-end policy and claims administration support. Through doing so, it automates what has traditionally been manual processes and enables product sales and administration at lower cost and with greater efficiency. Democrance’s platform is capable of servicing millions of customers and significantly reducing the administrative and servicing costs of insurance products. The lowered costs open up previously inaccessible markets and customer segments for insurers. Democrance, founded in 2015, is an insurance technology startup with a mission to enable partnerships that make insurance accessible and affordable for those who need it most. Democrance has created a digital platform that brings together two key industries – insurance and telecommunications. By forging new partnerships, we unlock new markets for businesses, while at the same time creating social value for populations that have previously been excluded from the benefits and protection insurance can provide. Through tapping into technology, we aim to restore the original purpose of insurance of providing mutual aid for those who need it most but can afford it least. AIG is the marketing name for the worldwide property-casualty, life and retirement, and general insurance operations of American International Group, Inc. This document carries summary information only. Products and services are written or provided by subsidiaries or affiliates of AIG Inc. including through American Home Assurance Company (Dubai br. ), AIG Egypt Insurance Company SAE (regulated by the Financial Regulatory Authority “FRA”), AIG MEA Limited and its branches AIG MEA Limited (QFC Branch) (regulated by the Qatar Financial Centre Regulatory Authority); AIG MEA Limited (Oman Branch) (regulated by the Capital Market Authority, Oman) and AIG MEA Limited (Kuwait Branch) (regulated by the Ministry of Industry and Commerce, Kuwait). Please visit our website at www.aig.com for additional information, including information regarding the registered office address of our entities. Third place and its cash award of USD 5,000 went to UAE-based Democrance, a micro-insurance provider for low-income populations. The prize was sponsored by ZAIN, the leading mobile and data services provider in MENA. The trophy was presented by ZAIN Jordan CEO Ahmed Hanandeh. Democrance’s mission of making insurance accessible and affordable for the lower-income population through the power of modern technology convinced the jury in nominating this promising fintech as the third startup on the winners’ podium. There are 350 million low- to middle-income people in MENA who do not have access to any sort of insurance. For this segment, risk protection tools such as life insurance, social security, public healthcare, personal and family savings would be life-changing. Recognising the opportunity, Michele Grosso, founder and CEO of Democrance (www.democrance.com), decided to do something about it. He has spent over seven years in the insurance industry, first with AXA and then with MetLife, across Paris, Cairo and Dubai. He has seen first-hand how providing insurance to the masses could solve social challenges in the region. He decided to channel his knowledge and passion for this business and convert it into a profitable and meaningful venture.